Home Depot refused to take back this obviously used saw… because it had been used. If you’ve ever questioned why our lab coat-loving cousins at Consumer Reports use secret shoppers to buy the things they test for the magazine, here’s a perfect example. 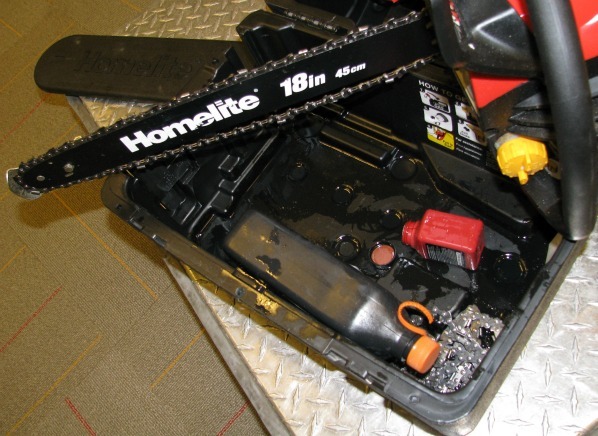 CR recently sent a secret shopper to a Home Depot in New Jersey to pick up a Homelite UT10589A chainsaw, presumably to test and not to get bloody revenge on promiscuous teens in Yonkers. The shopper paid full price for the “new” saw, but when he opened it up, he found it covered in sawdust and packaged with leaking bottles of oil. It had obviously been used by a previous customer and returned. In New Jersey, stores are supposed to mark previously owned products. That’s not the case in every state. Regardless, when the shopper attempted to return the saw to the Home Depot store, it would not take the item back — because it had been previously used. CR’s secret shopper found several chainsaws at another Home Depot in New York that appeared to have been previously used without any indicator that the item had been returned. When the shopper asked about one of the saws, an employee confirmed it had been previously owned. New York does not require that previously owned products be labeled. However, Home Depot claims that its policy for any gas-powered items returned by customers is to have them refurbished and then sold at a lower price as “reconditioned.” So these saws should have been marked accordingly regardless of state law. The company says it’s looking into what happened at the stores where the unmarked, used saws were sold as new. Even when a saw is marked as previously used, Consumer Reports cautions shoppers to think twice before being seduced by the lower price on a refurbished saw, as the manufacturer’s warranty may be weakened or expired.